Like most living things, archery has many personalities. Soft and gentle, ferocious, ruthless, beautiful, ugly, cruel--these, and many other terms, can find a place in the stories of bows and arrows whispered over time. Often, the ways the stories are told depend upon the characters involved, and more importantly, on how we want to see them. Savage becomes noble with a shift of perspective; "primitive," once scorned, is now hailed. These shifts mark our changing times and our changing fashions. Today it may be the individual uncontaminated by corruptions of civilization, but what was it that was celebrated in the past? Warrior is one such theme, and just as the idea of warrior is highly romanticized in contemporary North America, so also in past, at least in places with highly developed warrior traditions. One such place where warriorship was highly celebrated was India, notwithstanding the ideas and images we hold of India today. In traditional India, warriorship was associated with kingship and that in turn went hand-in-hand with demonstrated prowess in the arts of warfare. Of all of these arts, archery was pre-eminent. No matter what else, a king was trained in archery. 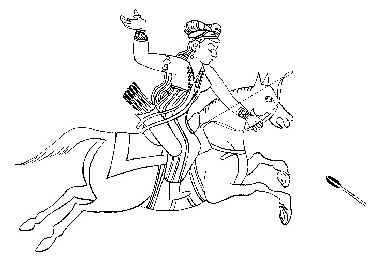 One of the richest sources of information about archery as a royal tradition comes from the great epics tales of India. Both the Mahabharata and the Ramayana, two massive sagas of royal lineages, are filled with passages that describe the techniques of archery, and the attitudes and customs surrounding its practice. Both these texts make it very clear that archery was a king's domain. Public demonstration of skill in archery was demanded of anyone who claimed the title of raja, or king, and there were many ways in which this skill was measured. One of the most celebrated sections of the Mahabharata describes how success in an archery competition secured a marriage, and through that, an alliance between two kingdoms. Set in a long and complex tale of a struggle over sovereignty, this passage highlights the characteristics necessary in a royal figure: strength, discipline, fortitude, composure, dignity, cunning, and a good archer. Put another way, it suggests that all the traits that make a good archer also make a good king. Arjuna, one of the heroes of the Mahabharata, proves himself to be all of these and more in the competition. Disguised as a mendicant priest and mocked by the other princes in attendance because he appeared to be such an unworthy candidate, Arjuna first succeeded in stringing the bow. This act alone brought murmurs through the crowd, as no one else could string that bow. The bow in question in this epic may well have been a composite bow, because of the emphasis placed on the difficulty of stringing it. Then, after Arjuna strung the bow, he took aim and hit the target. No small feat, here either, as the target was the eye of a glittering fish revolving on a wheel fixed on a post reaching high up into the sky. The dictates of the competition required the archer to take aim by looking at the reflection of the fish in a bowl of oil set on the ground. In one shot, Arjuna hit bull's eye--or the fish's eye in this case--and was garlanded by the daughter of the king who convened the competition. That gesture marked her acceptance of him as her husband, and her father's alliance with his royal household. The saga doesn't end here, but goes on and on, to end in a great battle where the abilities of Arjuna and his kinsmen dominate. This story is matched by many others with the same message equating kingship and archery, and the histories of royal dynasties, whether of Hindu or Muslim families, are full of images of archery. Even much of the Hindu temple art sponsored by royal dynasties features gods and goddesses restoring righteousness to the world through the use of a bow. Archery continued to be practiced in the Indian palaces up through the end of the nineteenth century. Portraits of Indian kings often show them wearing a thumb ring on their right hand, in an emblematic display of their status as an archer. Hunting was likewise a royal pastime and there are records of public demonstrations and royal competitions like those described in the Mahabharata. Sadly though, by middle of this century times had changed and today this custom of archery has virtually died. There are, however, some individuals still alive who received the traditional and highly ritualistic training in archery. In January 1995 I had an opportunity to speak with one such person, His Highness Thulajendra Raja P. Bhonsle Chatrapathy, the senior member of the royal line of Maratha kings who once ruled in Tanjavur, in Tamilnadu, India. With the help of Professor R. Vivekanandagopal, a scholar attached to the Tamil University of Tanjavur, I spoke with the raja for several hours in his palace. Even at 78 he was quite a lively figure who attributed his robust health to his earlier martial discipline. Our discussion had a certain poignancy about the skill he acquired in archery some sixty years earlier, for he was the last of his line to have received traditional training. By the time he was fifteen or so a fascination with European customs helped foster an indifference to traditional Indian sports. As the raja put it, they cast their bows aside for tennis rackets. The raja described the bows he trained with as shorter recurved bows, made out of metal. He recalled a tradition that the bow should be as tall as the individual, but he remembered his bows as shorter, maybe 36" when braced. A couple of examples of these short metal recurve bows are on display in the Government Museum of Madras. Both steel and brass bows were used by members of royal families in competition during the eighteenth and nineteenth centuries. Steel bows have a long history in India, as very early texts make mention of steel bows. By the time of the Mughal period (beginning mid-1500s), steel bows that were highly decorated, sometimes with gold and silver inlay, were fixtures in royal households. Though there is evidence that steel bows were earlier used in warfare, by the end of the seventeenth century of so, they may have become weapons for royal display. Several sources maintain that the range of a steel bow was limited in comparison with the composite bows of India. However, Robert P. Elmer, in his classic work, Target Archery, notes an advantage of a steel bow. Being of metal, it "never needed to be unstrung and so it could be kept at hand in the house as a weapon for instant defense." The Tanjavur raja stated he trained with a bow made out of brass, a metal that many archery aficionados whom I have since spoken with have questioned. But the king was emphatic: his bow was brass. He may have meant bronze, as in India, the two terms are used inter-changeably. The king described his bow as short, rounded, both in the grip and along its body, and decorated with a floral motif etched in the back. The ears of the bow were highly articulated, curling towards the back of the bow. He also drew a picture of what he called the kalasam (see figure 1), a tear-drop shaped plate projecting out from the back of the bow above the grip that served to fix the aiming point when shooting. He recalled the strength drawing the bow required of him, noting that the extent to which a bow was drawn depended upon an individual's ability. He remembered the bow string being made out of animal--perhaps cow--gut. The raja said he has no idea what happened to the bows he remembers in the palace. Simply lost is how he put it. He did remember one bow that represented the royal line when his father held public audiences, or durbar as it is known in India. He had an idea that the bow might be found in a local goddess temple where it was routinely kept, as a number of royal rituals centred around the power derived from and associated with the goddess tradition. One important annual ritual known as Dasara comes at the end of the autumn Navaratra goddess festival also called Durgapuja. In part the Navaratra festival celebrates the goddess's association with military success as there are several mythic accounts of the goddess Durga slaying a demon to restore order in the world. The festival is also associated with an episode from the Ramayana that exemplifies royal military success. Undertaken on Vijayadasami, the tenth day of Navaratri, Dasara likewise has overtones of a victory celebration, recalling victories of the past and ensuring continued success in the future. It is marked by the worship of the royal weapons, today symbolized by two swords. In the past royal bows were also consecrated in this ceremony. This rite which pays homage to the emblems of kingship is rooted in an understanding of the relationship between the goddess and sovereign power. In this rite, the royal weapons are understood to be empowered by the goddess's presence. _ivaji, the seventeenth century Marathi military leader who founded the Tanjavur royal line, is said to have received his sword from the goddess Bhavani, his line's tutelary deity. According to one account, he kept the sword on the goddess's altar when not in use; likewise the present raja thought the bow that represented his line was kept in, and might still be found in the goddess temple. He also noted that the Dasara celebration is still undertaken in Tanjavur, though the victory now invoked is conquest of evil rather than military success. In addition to the consecration of royal weapons on the day of Vijayadasami, the Maratha kings of Tanjavur demonstrated their archery skills in a pavilion in front of the goddess temple. That pavilion is called the seemollanghan chavadi, a name that translated to mean the site representing the imperial power, or ability to cross borders (seema=border; ullanghan=to cross; chavadi=building). There in an event that echoes the scene in the Mahabharata that I have described above, the king would take aim and shoot at an specified object to symbolize his prowess as well as his ability to overcome any adversary, whether human or in the form of a malevolent force. The demonstration was a statement of the king's sovereignty and the extension of his protection over his domain. Likewise, because of its auspiciousness, the day of Vijayadasami was when princes were introduced to martial arts, including archery. The day marked the beginning of their formal training under an eminent guru. The present raja was initiated into archery at the age of 13, the age of puberty, with a formal ceremony. In this initiation, he was ritually bound both his teacher and to his bow, before he was allowed to draw it. The rite was undertaken at the proper astrological moment, the avittam nakshatra, an asterism identified with Mahisa, a form of the goddess, that occurs during the Tamil month of Avani. The initiation ceremony was done in accordance with South Indian ritual procedure; the young prince was tied to his guru with a yellow thread fastened around his wrist as a priest chanted mantras that fortified the bond. The preceptor then handed the prince the bow he was to use during his training, whereupon he was instructed in the ritual process that followed. First he was to place flowers on the bow and arrows--in effect to invoke and honour the force of the goddess present in the weapon--and to recognize the divine presence in that bow by consecrating it with kumkum, a red powder used on temple images. After anointing the bow with kunkum, the prince then worshipped that presence in the bow by drawing an oil lamp before it. This action, known as arati, follows the ritual practices undertaken throughout South India in both domestic and temple worship. The effect of this act here is to consecrate the relationship between the youth and the bow, by directing attention not just to the weapon but to what is understood to be the divine force behind it. When preceded by this initiation ritual and undertaken with the proper attitude of respect and acknowledgement, the shooting of the bow is thus not only a discipline, but also an act of veneration, highly focussed and disciplined humility, as it were. A second and equally important effect of the initiation ritual is to acknowledge the tie between the student and the preceptor. In this rite, the acolyte is bound to his preceptor through life and death. Further, the survival of the tradition rests in this tie, for by instilling the practice of archery in his students, the preceptor keeps it alive; the cord that ties the student to the preceptor is the life-line of the tradition. Overall, the initiation rite reminds one of the complex of relationships--bow, student, teacher, training, practice, discipline, tradition, and attitude--that make up archery. The raja's teacher was a member of the vastad community, a community made up of "100 families" skilled in various martial arts. The relationship between the vastad community and the royal line was hereditary; the teacher who trained the raja also trained his uncle. The hereditary relationship was marked with lands endowed by the royal household to the vastad community and was annually renewed in ceremonial presentations of gold, silver, jewels and other ornaments. The raja said his father was very generous and that these presentations, especially to his archery teacher, were lavish affairs. When I asked the raja what has happened to members of the vastad community now that this traditional relationship has been abandoned, he wryly responded that they have gone off to find work in the civil service. Every morning the archery instructors came to the palace. The raja said he trained with his uncle's son. The palace also sponsored a school of martial arts in which about ten to fifteen students trained in archery, all of whom were in one way or another members of the royal family. I asked him if women has also received training in archery, and he said that in the past they had, but he was not sure if they had in his time. In response to that question, he showed me to a painting he had done several years ago of one of his ancestors, Sujanbai Rani, a queen who ruled for one year (1736-37). In this painting the raja had depicted Sujanbai Rani seated in a palanquin holding a short golden recurve in her left hand. The raja also noted that when he took up the bow, his teacher positioned him quite close to the target, perhaps six feet away. As his shooting got more proficient, his teacher kept increasing his distance from the target. When aiming, his concentration was fixed on a coin placed on a board. The raja remembered his training: establish his position, fix his aim on the coin, draw his string to the upper side of his cheek while maintaining his concentration on the target, and then release. One-pointed concentration was what he emphasized when he spoke about his training, and that he was taught to fix his aim before drawing the bow, even in shots that required him to shoot from unusual positions. The raja spoke about a thumb ring, but said that he had not yet used one. He was taught to draw the bow by holding the arrow between the thumb and fingers and pressing down on the arrow with the thumb (figure 2). He the released the arrow by lifting up his thumb. I suspect that had he continued training he would have eventually graduated to a thumb ring. He shot off the right side of his left hand, in contrast to Western-style archery which shoots off the other side of the bow. The iron arrow heads were, in his words, small and sharp. Finally, he indicated that archery exhibitions, held in the royal gardens, were highly competitive. His Highness Thulajendra Raja P. Bhonsle Chatrapathy was the last of his royal line to have received traditional training in archery. As we spoke he drew upon the memory of his youth to recall what he knew of archery. Though the time of which we spoke was some sixty years earlier, there was something in the raja's fingertips which seemed able to recall the presence of his bow. When I asked him to demonstrate his release with a pencil, his movement was immediate and automatic. Perhaps archery is a dying art in India; nonetheless it is still very much alive in the memories of those who once practiced it. On the question of brass or bronze bows, the author's husband, Jaap Koppedrayer of YUMI Archery, is collaborating with a metal worker in Maryland to come up with a copper alloy that can sustain the stresses and compression required in a working bow.